Mine asteroids, salvage space debris, build space ships and stations, manage fuel and energy, trade goods, performs missions and fight against enemies in large open world with realistic 2D physics based on orbital mechanics or in alternative, more classic game mode. Mostly Positive (308) - 78% of the 308 user reviews for this game are positive. “It is amazing to work with community! We are reading every suggestion and answering on your every question. Please feel free to join our Discord chat and ask or suggest whatever you want. The game in VERY active development, so follow our development blog for news. “It is hard to predict release date for the game with such unusual concept and complex features. Especially if it is our first project. Earlier we announced a release date, but development took more time than we expected, so we decided to not announce any further release date if we are not sure about it. “Since we released the game we made a lot of work. We added multiplayer, save/load, trade. An interface, ship constructor and production system was redesigned several times. Graphics was completely changed from 2D to 3D! More complex crew system (also not sure, will discuss it with community). Overall improvements of game design, so the player will be able to slowly improve its technologies, fleet, encounter with stronger enemies and accomplish more complex procedural missions. “The price will be slowly increased during development according to quality and amount of features and content. Initial price of first Early Access release was 8$. At current state, the game cost 11$. When we increased the price, we asked a community about this and it was approved. You can read more details in our blog here and here. When all planned features will be implemented and all bugs will be fixed, after stable release, we plan to increase price up to 20 or 25$. Therefore, during entire early access you can buy the game with discount! Some developers set the price for early access higher than after release, making money on the thirsty players. We are not going to do that! “For almost two years of development we are working with community very closely! A huge amount of work has been done largely thanks to our community! We're consider any ideas from community and your ideas really can be implemented in the game. You shouldn't thinking "I have so cool idea which will make the game so great! But probably developers are to busy to listen me". We read everything what you wrote to us and we glad to any ideas which will help us to make the game better together! We receiving a lot of suggestions and bug reports. We have a huge list of suggestions in our to-do list and all bug reports added in to-do list and solved as soon as possible. Our community helps us to create detail guides about the game. Since interactive tutorial not yet implemented, we even added a link on this detailed guide http://steamcommunity.com/sharedfiles/filedetails/?id=557510735 from one of our community members right into the game! Translations of various languages and correction of our English is done completely by our community! We using GitHub to receive a help from anyone who wish to participate in localization. We are actively answer almost on anything what you wrote to us in Steam Community Hub. Usually we are trying to release updates as often us possible, following by logic "As soon as we have a new feature - we should release it", but for the next update we want to use a different approach. In the comments to our previous post, people suggested us to focus on the big update, instead of a sequence of smaller updates which are not so noticeable - and that is a great idea! This will be very good for popularity of the game, and more important, for quality of gameplay. Some people also thought that since the game already 4 years in development and still not very popular - it will not be popular any time soon. This seems logical, but actually this is not true. Currently we are working on the various game design tasks and made a conclusion that the game already have large amount of interesting and complex features, however most features just not accessible due wrong game-design solutions, wrong balance of various values or low usability of interface. So, we are going to solve most of these issues in the next, big update, which should put quality of the game on completely new level. Building of space ships and stations it is the most important feature of the game, it is very fun to create various ships in sandbox mode, however, surprisingly we realized that creation of ships in non-sandbox game mode is completely not fun. Usability is so much worse due various reasons and we are not happy with how it works in survival game mode, so it should be solved. In sandbox mode your creativity is not restricted and this is great, but in survival mode, the game just does not allows to do any mistakes. Everything is too slow, too expensive and seems like the only way to build something in survival mode is to design a ship in sandbox, make a screenshot and use a screenshot as a plan to build that ship in survival mode. But this is not a way of gameplay which we want. You should be able to unleash you creativity even in non-sandbox game mode. Move tool will be much more accessible. It can be used not only within area of shipyard, but also in large circle around it, so it will allow to construct not only a ship inside shipyard, but also a space station itself. 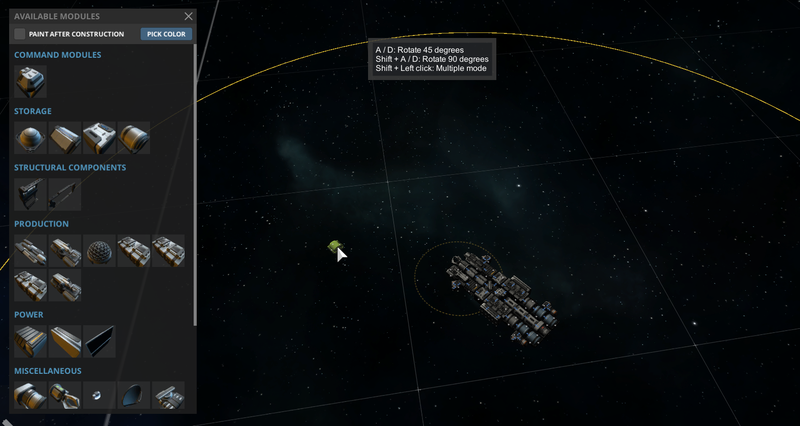 Also modules for construction can be placed in much larger radius than radius of engineering module. Large yellow circle shows a radius where you can easily place or remove modules (but modules still should be finished with engineering module which have smaller radius. And here large yellow circle shows a radius where you can use "move tool" to quickly design or redesign your ships and space station (like on GIF animation above). Most modules will be much more cheaper, especially structural and decoration modules. It is not normal that you are forced to mine huge amount of resources just to build a few decoration elements around your space ship or station. Recipes for crafting should create an interest, it should not restrict a creativity. This seems simple, but turned out it makes construction so much better and more fun. Fighting against other space ships it is the second, very important feature of the game. The problem is - it is basically non existed in sandbox game mode. Technically the game is capable to provide an amazing space battles between huge ships, but it is almost impossible to encounter during non-sandbox gameplay. And this is another critical flaw of the game which should be fixed in the next update. Encounters with enemy ships will be much more often and ships will be much more balanced, as well as access to weapons, ammunition and tools for more convenient repairs between combat encounters. These changes also will have a dramatically impact of overall quality of the game. Trading between space stations it is an interesting way to earn more credits, but we received a lot of feedback from community about trading and how inconvenient it is - and this is completely true, currently it is a way too overcomplicated, both in terms of functionality and user interface. 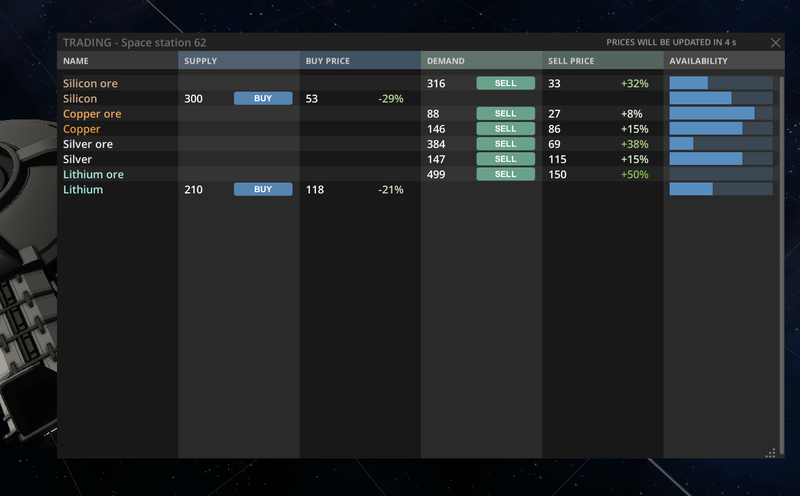 So, in the next update the trading will be completely redesigned. A functionality of trading now should be much more obvious and easier to use. 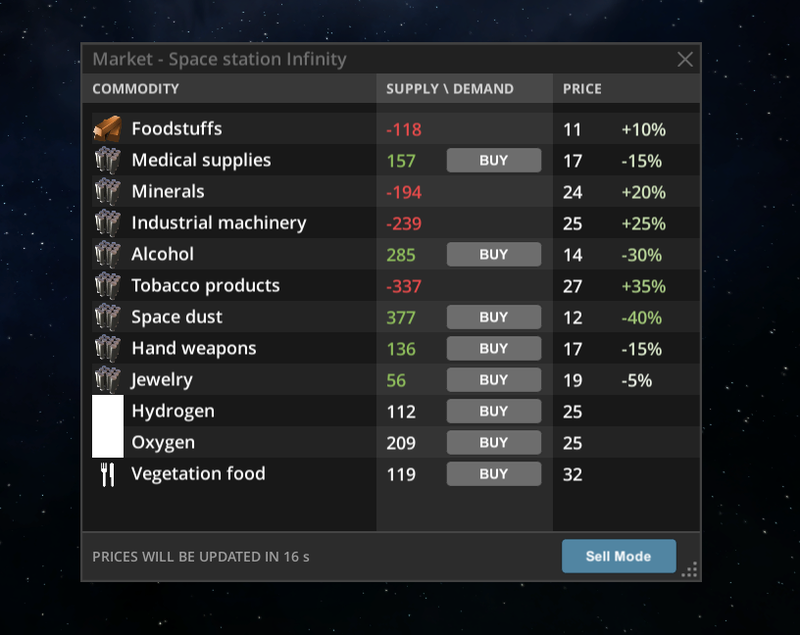 Also we implemented a special type of commodities which is suitable specially for trading between space stations. Besides that, a lot of smaller improvements also will be implemented, each improvements separately seems non significant, but in complex it makes the game so much better. The result should be amazing! We are not sure yet. We planning to release the next update within this month, but we want to make it very polished so maybe it will take a bit more time. Anyway, we will keep you informed about development progress. 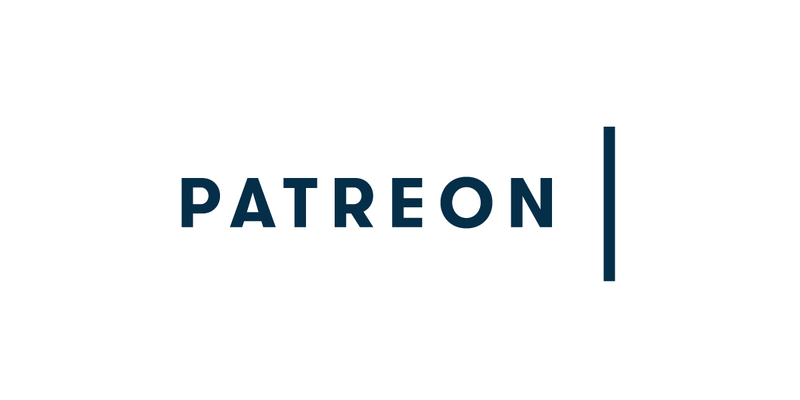 Also we want to say thanks for everyone who support us on Patreon! You provided a huge help for us in this month, which helps us to develop this big update. Approximately a year ago, for some reason our sales of Celestial Command were reduced in several times, as a result, at this moment it is barely enough to cover our monthly expenses for food and bills. Of course, we are very, very happy that we have a possibility of full time develop the game we love, and receive enough money for basic needs, however, we almost do not have any financial reserves. It means that at this moment, even a small, insignificant issue may ruin an entire development of Celestial Command which was built for more than 4 years and correctly closer to finished game closer than ever before. For example, If one of our computers will require a repair, or if fridge in the kitchen will require a repair, or if someone will need a meeting with a dentist, or any similar insignificant situation which will require a bit of additional expenses - we will be out of money, and we will not be able to develop Celestial Command anymore. You are probably noticing that our updates are frequent, and we are adding a lot with each update by adding more and more features and moving to the goal of finished, polished and super enjoyable game. We are answering on all questions for the community, working during holidays or more than 10 hours per day, and we want to continue to do that without distractions of things like lack of money on basic needs. We need relatively very little amount of money. Only 1500$ per month if enough for basic needs of our entire team (there are 3 people in our team). This is very little in comparison to average costs of products and salaries in the game development industry, which usually cost a lot more. 1500$ per month it is a tiny amount of money for average game-dev company, but it is very large and important for us. It would be super disappointing if more than 4 years of development of unique space simulator will be ruined due lack of such a little amount of money. But you have a possibility to help us with that! At this moment we sold 25000 copies. If only 2% owners of Celestial Command (500 people) will donate just a 3$ per month (one cup of coffee and hot dog) - it will completely cover a basic needs of our team and we will be able to develop the game even if it will have zero sales. 3$ per month it is almost nothing for most owners of the game, but it will keep development safe. Even the lower amount of money will provide us a huge help, because with the combination of our regular sales it should be enough for basic need too. It is popular service where you can provide financial help for creators of various things on per month basis. Just select how much you wish to donate and the money will be automatically transferred to us each month. It is completely safe, secure and you may abort monthly donations any time. Also you will receive some cute gifts. Thanks you! We hope on your help! Also there is an update version 0.8831 with some critical bug fixes and nice improvements. 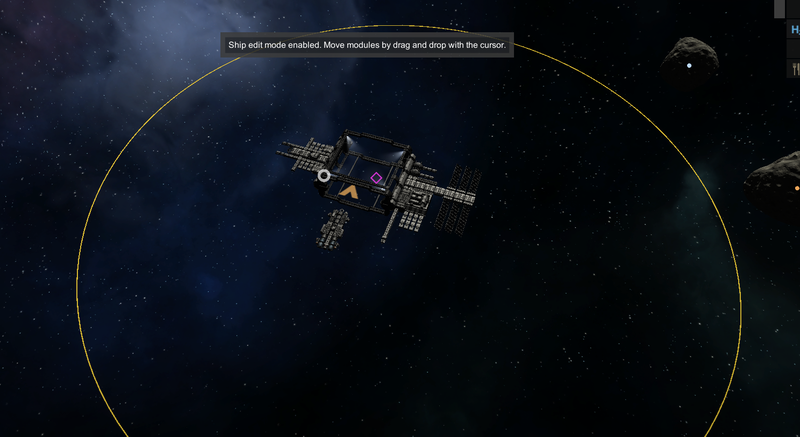 Speed of research module change from 0.2 to 0.25, power consumption from 300 to 50, so research at the beginning of the game now can be performed with reasonable speed. Thanks for everyone who voted for us on Steam Greenlight! We are proud that community approved our project and allowed us to be in Steam. Thanks you very much! Celestial Command is a realistic co-op crafting survival sandbox space game which unites an orbital mechanics, realistic physics, ship constructor and various features of classic space games. 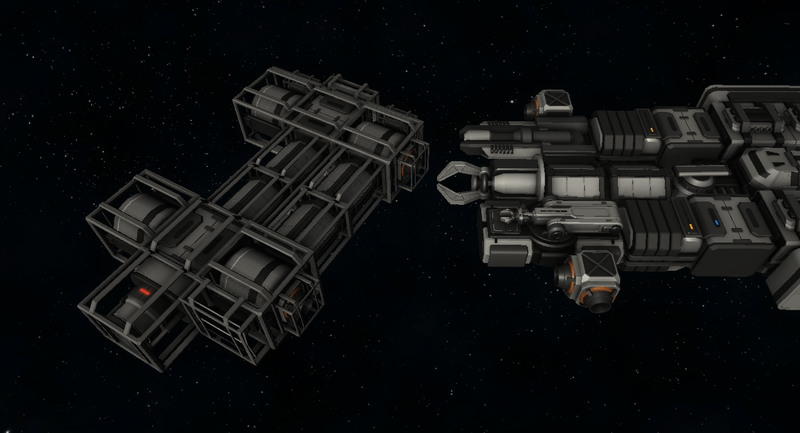 Mine asteroids for useful resources or salvage wreckage of broken ships in order to build new modules and produce fuel. Trade goods between stations or complete procedural missions provided by NPC stations and earn additional credits to buy new modules on a shipyard. The game has now been in active development, so even more interesting features added almost each update! Check our development blog for more information about development and future plans. THIS SOFTWARE IS CONSIDERED TO BE IN ALPHA STATE, AND MAY CONTAIN BUGS. CELESTIAL COMMAND DEVELOPERS TEAM TAKE NO RESPONSIBILITY FOR ANY DAMAGE OR LOSS OF DATA THAT MAY OCCUR AS A DIRECT OR INDIRECT RESULT OF USING THIS SOFTWARE, AND CANNOT GUARANTEE ANY DEGREE OF PERFORMANCE OR STABILITY, OR EVEN THAT THE SOFTWARE WILL BE USABLE AT ALL. USE AT YOUR OWN RISK. ©Celestial Command. ALL RIGHTS RESERVED.